FRESNO – Dr. Joseph I. Castro will make his first visit to the World Ag Expo as Fresno State president when the largest annual agricultural exposition of its kind unfolds Feb. 11-13 in Tulare. An estimated 100,000 visitors from 70 countries visit the World Ag Expo each year to learn about agriculture and the latest technologies. Fresno State’s participation includes water researchers delivering seminars and student Agriculture Ambassadors staffing a booth in the Hilvers Career and Education Center (booths 8001 and 8002). Castro and his wife Mary (whose father milked cows on a dairy farm in Laton for 40-plus years) will appear at the booth about 10-11 a.m. on Thursday, Feb. 13, with Dr. Charles Boyer, dean of Fresno State’s Jordan College of Agricultural Sciences and Technology. Their appearance will follow the California Agriculture Leadership Alumni breakfast from 6:30-8:30 a.m. where the president will be formally introduced. The annual breakfast has raised more than $650,000 to benefit the California Agricultural Leadership Foundation. 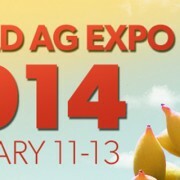 After the breakfast, volunteers and organizers for the Ag Expo will provide the Castros with a tour of the grounds and exhibits before stopping at Fresno State’s booth to greet visitors as part of “Ice Cream with the Dean Day” Thursday. Fresno State’s popular student-produced ice cream will be served free at 10 a.m. until supply runs out. Dr. Sandra Witte, the Jordan College associate dean, will also be present. Jordan College’s Agriculture Ambassadors will be working at the Ag Expo with Desi Molyneux, a University Outreach Services counselor, and Dr. Steve Rocca, associate professor in Agriculture Education, to share tips on admission and opportunities within the college. Fresno State’s booth will display products from the Rue and Gwen Gibson Farm Market, University Farm and Floral Lab. Prior to the expo, the student Ambassadors will staff a booth at the Fresno Yosemite International Airport from 9 a.m.-9 p.m. Feb. 8-9 at the baggage claim area to welcome guests and provide information about transportation, events and seminars. A series of water and irrigation seminars will be presented from 10 a.m.-3 p.m. Feb. 13 in the World Ag Expo Seminar Center by Fresno State’s International Center for Water Technology in partnership with Irrigation Association. Bill Green, an education specialist with the Center for Irrigation Technology, will discuss, “Good Irrigation Efficiency by Increasing Distribution Uniformity” at 10:30 a.m. The International Center for Water Technology is a research hub dedicated to providing developments and solutions to improve water use and efficiency. The program has a broad spectrum of research topics including water supply and quality, flood protection and environmental enhancement.